Charles Roberts - Uilleann pipemaker. 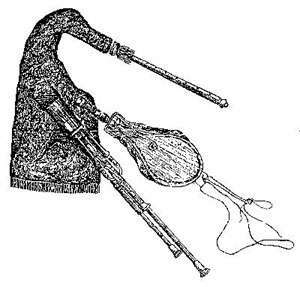 Uilleann Pipes, previously known as the Union Pipes or The Irish Bagpipe started to appear around the beginning of the 18th century. By the middle of the 18th century the first tutor was published by J.Geoghegan. The first regulator was added towards the end of this century and it was this point the name Union Pipes was used - the union of the regulator with the chanter. A regulator is a chanter which is permanently closed at its end and is played using keys only. A notable maker of the Irish Pipes in the 18th century was Timothy Kenna, formerly a maker of spinning wheels. He was followed by his son Thomas who made pipes into the first part of the 19th century. Many of the sets made by Kenna are still in use today and are much valued for their sweetness and tone. Pipes at this time were mainly made from boxwood and later ebony, the pitch of the instrument being flatter than that of today, and ranged: B flat, B natural, C natural and C sharp. Robert Reid in Northumberland a maker of Northumbrian Smallpipes from 1760 made many fine sets of Union pipes at the start of the 19th century. He made chanters sometimes with a double bore that could be reeded to the pitch of D. He often made four to six drones and two regulators for sets. By the middle of the 19th century pipemaking was being developed quite fast and many sets were being made in Ireland by a succession of makers. After the famine came emigration and some pipe makers also left Ireland. Michael Egan who first established his business in Liverpool, England and then later in New York, USA was one of them. Also the Taylor brothers who were established in Philadelphia and made many fine sets and were responsible for what is now termed Concert D sets. Finding the sound level of the older type of pipes too quiet for playing in the large concert halls of America, they enlarged both the size of bore and the finger holes on the chanter, swelling the volume of sound. The pipes made before this period were known as flat pitch pipes.